Two Late Antiquity residential buildings have been found by the archaeologists excavating the Ancient Thracian, Greek, and Roman city of Odessos (Odessus) in the downtown of the Bulgarian Black Sea city of Varna. The two buildings discovered inside the Late Antiquity fortress wall of ancient Odessos (known in Roman times as Odessus) are dated to roughly the same period as the wall – the 4th-5th century AD. 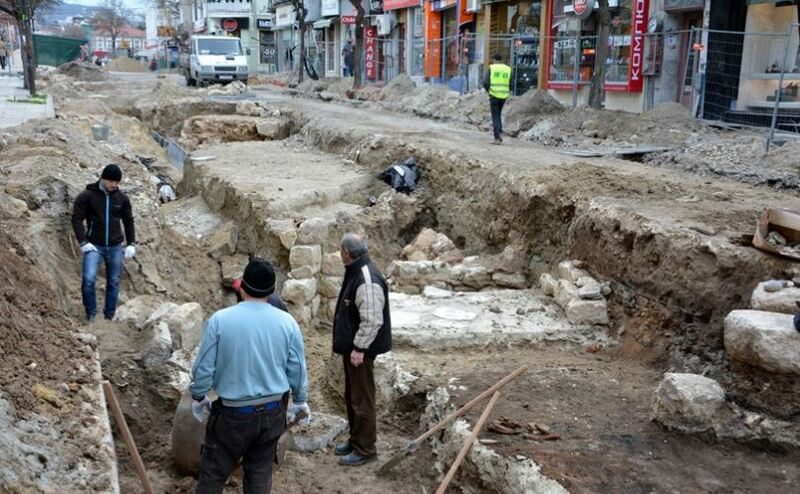 Their floors are paved with large stone slabs; a wooden shed from the Late Antiquity has also been found on the excavation site of the Varna Largo, the pedestrian zone under the Knyaz Boris I Boulevard in the Varna downtown, lead archaeologist Prof. Dr. Valeri Yotov from the Varna Museum of Archaeology has announced, as cited by local news site Varna Utre. Yotov was quick to explain that the newly uncovered ancient buildings and parts of the Late Antiquity wall (which is just one of ancient Varna’s several fortress walls dating back to different time periods) will be exhibited in situ under glass covers for the numerous tourists to enjoy over the summer season. The discovery of the two buildings has come just before the rescue excations of ancient Odessos / Odessus were wrapped up on April 1, 2015. 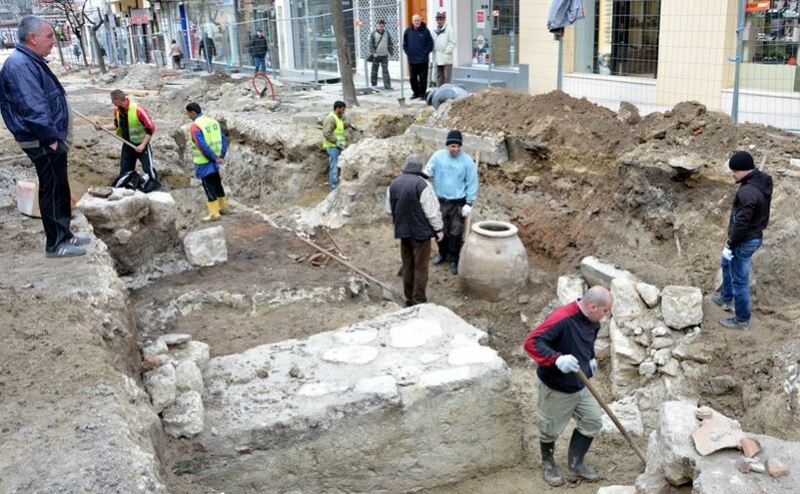 The digs, which started on March 12, 2015, after in January 2015 construction workers rehabilitating the Varna downtown water supply and sewarage came across a 5th century earthen jar (pithos), have had to be wrapped up so that the main pedestrian zone of the city can be paved for the summer tourist season. During their brief rescue excavations of Ancient Odessos centered around the St. Nikolay Church in the downtown, the Varna archaeologists found a second earthen jar, a stone mill, and four skeletons partly buried under the late 4th century fortress wall. The archaeologists still have not made up their minds whether they have found a necropolis or a different type of burial site since no additional items have been found in the supposed graves. However, the discovery of the Late Antiquity fortress wall of Odessos has been their greatest achievement as they knew that the ancient city had a fortress wall from this time period but had not been aware of its location. The rescue digs did not go smoothly, however, as the newly excavated site was flooded “like Atlantis", as the local press put it, a couple of times after water pipe failures, and at one point workers of the local utility cracked one of the 5th century pithoi and did some damage to the fortress wall; the four skeletons, three of which were in situ at the time of this incident, were not affected. Now, in less than a month of rescue excavations, the Varna archaeologists have managed to establish the location of the Late Antiquity fortress wall along its entire length, Yotov explains. In his words, during the 20th century when the water and sewage pipes and electricity and phone cables were laid underground, “fatal damage" was done to the ruins of Odessos. “We have been assured by the team of architects dealing with the modernization of Varna’s center and by Varna Municipality that they will collaborate with use in order to realize the project for turning the newly uncovered ancient objects into a tourist attraction," Yotov says. He has confirmed an earlier announcement by the local authorities that the excavations of ancient Odessos will be frozen for the summer but will be resumed in the fall, after the end of the tourist season, when the local archaeologists plan to try to find one of the fortress towers near the St. Nikolay Church, and potentially to continue their search for one of the city’s main gates. Once the excavations in the fall are completed, they plan to place near the church a tridimensional model presenting the authentic appearance of the ancient city of Odessos.